The CD-140SCE dreadnought is part of Fender’s new Classic Design Series of acoustic guitars. It’s an electro-acoustic that’s been fitted with an upgraded Fishman Presys pickup/preamp system. The added electronics enhances the quality of the already great Fender acoustics in the lineup, offering an all-in-one, stage-ready guitar package that beginners and pro musicians alike will surely appreciate. Fender debuted the Classic Design Series at the National Association of Music Merchants trade show in winter 2017. 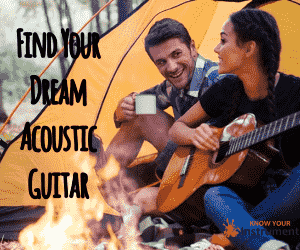 The new models in the company’s acoustic guitar catalog are designed and built to offer premium features and deliver a gutsy yet comfortable playing experience for beginners. Some of the upgrades include a novel easy-to-play neck shape, solid spruce or mahogany tops, rolled fretboard edges and the addition of the Fishman Presys preamp, like in the case of the CD-140SCE. As a result of all these improvements, Fender was able to offer a lineup of acoustic guitars that are not only extremely playable but affordable as well. All of the CD-140SCE variants are priced at $400, which is actually a steal because they’re Fenders. The company aims to show that you can have a high-quality instrument at an accessible price point, which is really important for those dreaming of becoming musicians like the great Jimi Hendrix, who used a number of Fender electric guitars. Let’s take a closer look at the Fender CD-140SCE and see if it’s really as good as it looks. The Fender CD-140SCE has a solid spruce top with scalloped X-bracing to keep the guitar sturdy and stable as well as prevent it from collapsing under the tension on the strings. In addition, a solid top made of spruce responds very well to a variety of acoustic playing styles. The Fender CD-140SCE has laminated rosewood back and sides for added resilience and a mahogany neck with black binding for increased strength. Rosewood is also used for the headstock overlay or the headcap, the bridge and the fingerboard, giving a striking contrast. The neck of the CD-140SCE is comfortable and easy to play, largely thanks to the rolled fretboard edges. Rounding off the edges of the 20-fret fingerboard removes the sharpness, making it more comfortable to play especially when you need to wrap your thumb around the neck. Classy pearloid dot inlays adorn the fretboard. The guitar has a 25.3-inch scale length. The guitar is also fitted with chrome die-cast tuning machines that hold pitch very well, a dual-action truss rod for adjusting the string action, a Graph Tech NuBone nut (1.69 inches wide) and saddle to boost the sustain and tonal clarity as well as keep the strings consistently in tune. 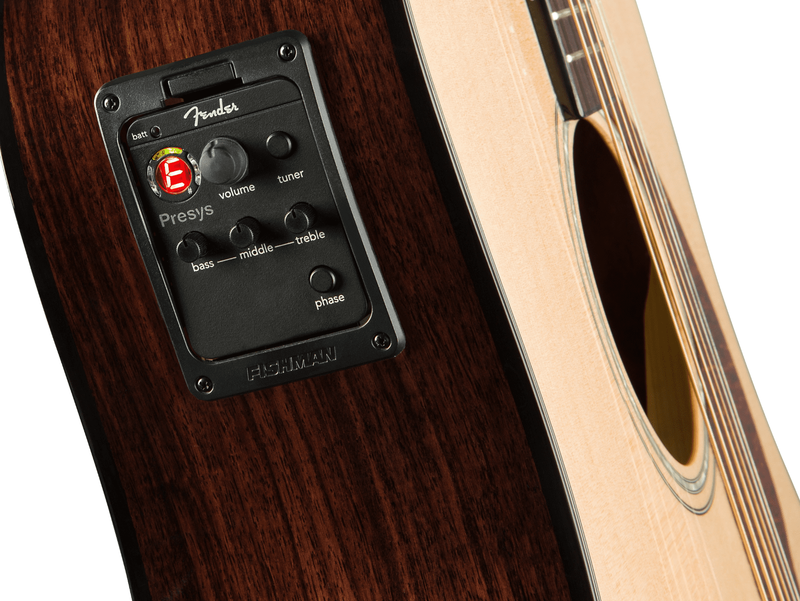 The Fishman Presys pickup/preamp system has controls for volume, mid, treble and bass. It also has a phase button. The side-mounted preamp also has a built-in electronic tuner. A tortoiseshell pickguard and the gloss body finish give the guitar a really classic look. The pearloid rosette design around the soundhole is exclusive to the CD Series. Another striking feature of the CD-140SCE is its cutaway body, which makes it easier to access the upper frets for practicing those high-register chord progressions. You can choose between a Natural or Sunburst finish. The guitar also comes with its own protective hardshell case so you can store or transport it safely. Overall, the Fender CD-140SCE doesn’t look or feel like a $400 guitar but something that costs much more. With a premium build and advanced features, it definitely rocks. How does it sound though? No worries – there was never really any doubt about the sound quality of the CD-140SCE. The dreadnought body shape and overall build of the Fender CD-140SCE give it plenty of volume as well as a full-bodied, clean tone. Spruce is a material of choice for acoustic guitars because of its dynamic range, brightness and responsiveness to various playing styles. The scalloping on the bracing of the guitar also shapes the sound of the guitar. This is because scalloped braces work with the strings in such a way that midrange frequencies are scooped out to bring out the bass, high-treble frequencies and overall volume. The result is a well-balanced tone with plenty of projection. 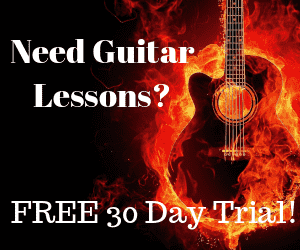 For beginners, this means more productive lessons and practice sessions when you’re fingerpicking, flatpicking and strumming – you’ll be able to hear the nuances among notes and chords more properly. Guitars with solid tops, like the CD-140SCE, also develop better tonal quality the more they are used over the years. This means that the more you practice and become a better musician, the better the guitar sounds too! Unplugged, the guitar produces a vibrantly rich and pure tone with a lot of resonance. It’s all crisp, clear and clean. Plugged in, the Fishman Presys system works as well as it should, amplifying the sound coming from the guitar without muddying the tone. Tonal quality is consistent up and down the neck, which is important if you’re new to the guitar and are only just beginning to develop your ear for pitch. The strings stay in tune for a long while too. All in all, the Fender CD-140SCE delivers – just like Fender promised. There are two other guitars that carry the CD-140SCE mark: an all-mahogany variant and a 12-string option. ● CD-140SCE All-Mahogany – this variant, available in Natural finish, is structurally the same as the CD-140SCE except that it has a solid mahogany top, laminated mahogany back and sides, mahogany neck and mahogany headcap. Yep, it’s all mahogany alright. ● CD-140SCE 12-String – you’ve guessed it – this is the same model but with 12 strings, offering that bell-like jingle-jangle for a classic sound. It also sports a Natural finish. Why buy the Fender CD-140SCE? The features are a win, the sound quality shines, the price is just right – what more can you ask for? The Fender CD-140SCE hits the right notes, is sturdily built and won’t break the bank. We’ve taken at the specs in detail and judged the sound, and we say this guitar is definitely a good – nay, great – buy. It’s possibly the best entry-level acoustic-electric guitar you can buy for $400. This puts the guitar in the midrange price category. That said, this guitar is for aspiring musicians who are keen on taking the guitar seriously. The best way to do that is by learning on a quality instrument right from the beginning. Convinced? The Fender CD-140SCE is ready when you are.